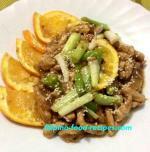 This Lumpia Wrapper Recipe, or more popularly known as Crepe is for Filipino Lumpia - whether the filling is mixed vegetables, Ubod or Heart of Palm, or Bamboo Shoot. 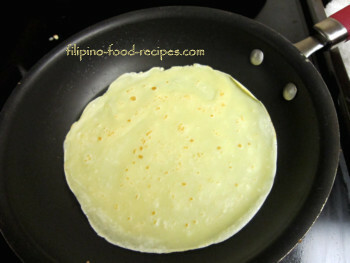 Crepes are very thin pancakes made from eggs, milk and butter, and can be for savory fillings(recipe with a pinch of salt) or for sweet desserts (recipe is with sugar added). 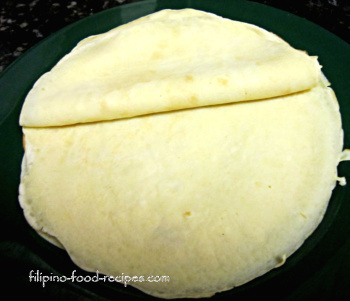 The batter is quite thin and it takes practice to make a nice round Crepe. You have to be quick in swirling the Teflon or non-stick pan to evenly distribute the batter. 1 Using a hand mixer or a blender, mix all the ingredients except for the 2 tablespoons butter for brushing the pan. 2 Set the mix aside for an hour or so until there are no more bubbles. 3 Heat up an 8 inch teflon or non-stick pan to medium heat. 4 Brush the pan with some butter and take out from heat. Pour 1/3 cup batter and quickly swirl the pan to distribute the batter evenly and make a round crepe. 5 Put the pan back to the stove top and let cook, once the sides are coming off from the pan, turn the crepe over to cook the other side. Remove from pan. 6 Repeat from Step 4 until you finish cooking all the batter. Unlike pancakes, crepes are light in color and not golden brown, so do not overcook. No mixer or blender? No problem. Just beat the eggs well and mix the rest of the ingredients - then strain well before setting aside. No teflon or non-stick pan? Use a regular pan but make sure you heat and oil the pan well before putting the batter in.